There are some days as a garden designer when you can’t believe your luck at what a mind blowingly fun and satisfying job you do. There are other days that…..well……you enjoy even more! Now I don’t mean to be smug. I completely recognise how lucky I am to have found something that I love, that clients are actually willing to pay me for and that Paul supports me wholeheartedly in, with endless encouragement and funding for worldwide garden-seeking trips…….but I don’t want to get into Oscar acceptance speech territory. Today was one of those favourite of favourite days. 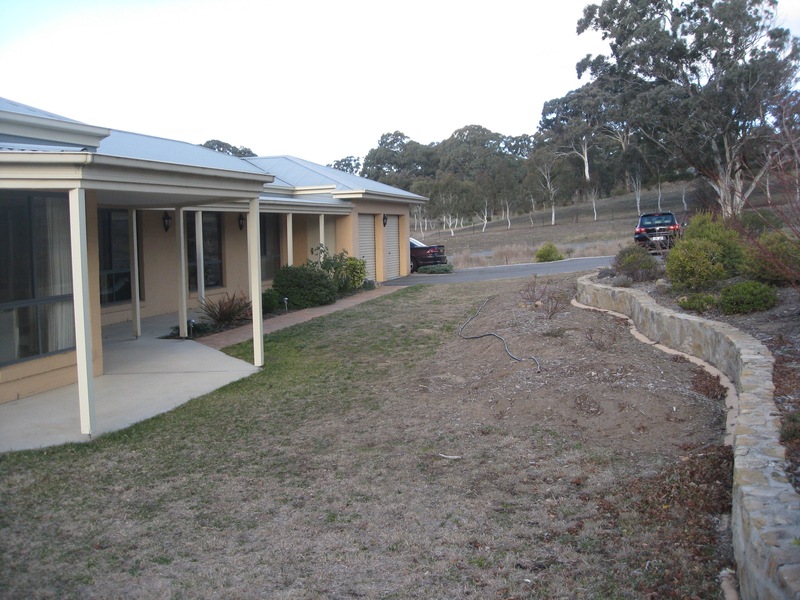 Helen, a client on a three acre property just outside Queanbeyan, emailed some photos of her developing garden to me. Just over a year ago we planned a completely new garden for the front of her house and after Tell came in to complete the hard landscaping, Helen set about the planting herself. Part of what makes every day a favourite day is the immense variety in my job. The enormous range of properties, climates, styles, clients and wish lists that I encounter means that it is impossible to get bored; something that in the past, I have had a tendency towards. However, if you absolutely forced me to pick a type of project that is always especially special to me, it would be those where my client creates the garden themselves. 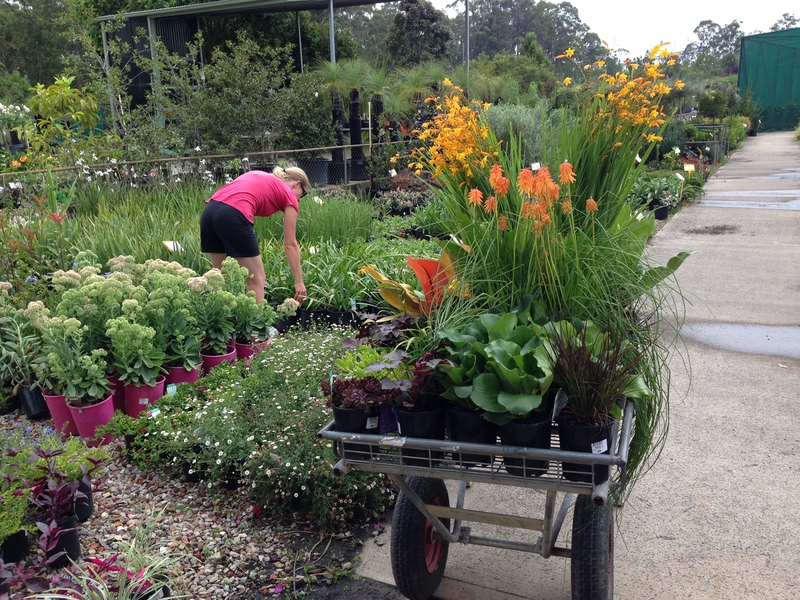 The fact of the matter is, I quite often find myself recommending to gardening-loving clients that they employ a landscaper for the initial planting. It just isn’t practical for someone with a full time job and two or three young children to find the time to effectively create a garden from scratch. Better to have it put in for you and then enjoy the less time consuming job of keeping it looking nice. Horses for courses and all that. But when a client puts in hours of their own time over a period of months and totally transforms their environment, the warm glow I feel is indescribable. Something like pride, but not quite pride. After all, I haven’t created the garden. It is no mean feat to transform your outdoor space and I clearly recognise how much time, effort and love, not to mention determination (when, as inevitably happens, some plants just turn their toes up and die, no matter what you do) has gone into it. It’s like their huge achievement touches me deep inside. The most amazing feeling. It also fills me with pleasure to see a beautiful garden. Simple as that. And when the passion and satisfaction and pride and energy of the gardener is clearly tangible, for me, it’s the best thing in the world. But really, enough of me, you want to see this beautiful garden, right? I’ll firstly show you how the garden looked at the start. The lawn in front of the house was desperately struggling and Helen and Garry weren’t sure what to do with it. They had had a landscaper come in who had suggested giving up with the lawn and mulching the area simply with gravel. 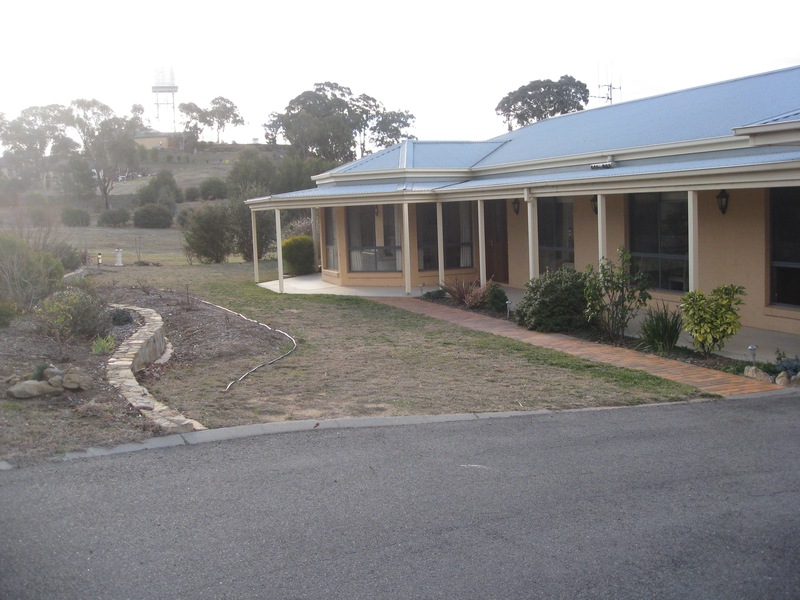 A practical solution to a tricky area and with three acres to play with, Helen and Garry had plenty of space for all the plants and lawn they desired, but the area was on a slight slope and they had visions of the gravel piling up at the front door after a heavy storm. This garden was also in an extremely dry area, with scorching summers, hard frosts in winter, exposure to the elements on all sides, poor quality soil and a whole community of hungry kangaroos and rabbits living on site. Not many of us garden in conditions anything like as challenging. We looked at it together and decided that drought tolerant, wild animal resistant, non-fussy plant coverage was the way to go. We came up with a colour scheme to avoid the area looking overly busy and then hoped that we could identity some plants that ticked every box! We also decided to change the pathway to the front door which was a bit out of proportion with its surroundings. We chose stone to match the existing retaining wall and created a generous soft curve from the parking area, past the curving wall to the front door. We made it wide enough to allow plants to soften the edges in time. This was a garden where I recommended a slowly, slowly approach. With three (difficult) acres to think about, it was not sensible to try and plant everything on day one. Much better to put a few plants in, check how they fare and then propagate more through cuttings and division. To Helen’s immense credit, within the space of a year she has already multiplied her plants considerably, having started off somewhat unenthusiastic (and unconfident) about propagating at all. So this is Helen’s garden after one year. I don’t know what you think, but I hope you feel something warm inside too. What an amazing welcome to the property. Helen’s achievements are particularly outstanding when you learn that last summer was an exceptionally hot season, with extended periods over 40 degrees. This was followed by an exceptionally cold winter, with many nights bringing in minus six to minus eight degree frost. Extreme weather events are tough on plants at any time, but in the first year of establishing, plants are especially vulnerable. It just goes to show what is possible, even in the unkindest of conditions. Look at this and don’t ever be put off by challenges, whatever they are. Helen mentioned to me that when she sees all the ‘whizzy’ gardens on my blog, she questions her own garden’s progress. I say, ‘Helen, you are gardening in a clay filled desert with Siberian winters and you are an inspiration to us all’!! Thank you for generously sharing your gardening journey with us. Let’s hope we get an update of this spectacular garden in another year’s time! Helen is an inspiration to all us gardeners – I won’t ever complain about the rate at which weeds grow any more! Isn’t she just? We should feel lucky that weeds do grow! It is stunning, Jo, isn’t it? I can’t quite believe what Helen has achieved. Just amazing. Absolutely wonderful! So welcoming. Well done to you both! You did a great job with the hard landscaping, Tell. I really need you back in England now though please! We moved here last month for Paul’s work. I’m actually really enjoying it! Wonderful. Oh, my. You are good. Gosh, I’m blushing! Although really I just gave Helen a point in the right direction and there was no stopping her. She is my very favourite type of client! Thanks for your kind comment, though. Hello Janna, I sometimes come back to look at your article, but it must be a long time since I looked at the comments as I see that Tell was back in England in 2016 too. I think of you both most days now that I’m retired and able to spend much more time in my garden. It is a true pleasure and I really do think the house sits comfortably in its now expanded garden, as you encouraged me to think it could and would. Thank you! Much as I like to read your blog, I am really pleased to know that you are often very busy settling into your own garden now. Hello Helen!! It’s so lovely to hear from you and thank you ever so much for taking the time to send a message. I too, often think of your gorgeous garden, and how it must be thriving now it’s all established. I’d love to see a photo! In our new garden we also have many rabbits and hares and they remind me of your battles! How lovely that you are now retired and able to enjoy your garden all week. It’s just fantastic to hear that it gives you such pleasure. Once you get into it there is nothing better, I think! I feel so lucky to now have all this space to play in! Thanks for being in touch.